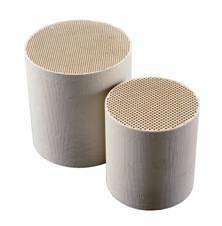 Our diesel engine exhaust diesel particulate filters (soot filters) utilize ceramic (cordierite) wall-flow filter elements to capture particulate matter from mobile and stationary diesel engines. Each filter is coated with a proprietary catalyst coating that enables the filter to self-regenerate while reducing particulate matter (soot & smoke) by a minimum of 85%. In addition, the catalyzed filters can reduce CO emissions by over 95% and unburned hydrocarbons (UHC’s) by over 90%. The amount of reduction will depend upon fuel quality and operating conditions including exhaust flow and temperature. The oxidation process begins at low temperatures where CO emissions start to oxidize to CO2. As the exhaust temperature increases to 580 oF and above, the oxidation process rapidly accelerates dramatically reducing diesel particulate matter DPM), hydrocarbon emissions (HC) and odors. Following a short break-in period, particulate matter reductions between 90-95% are commonly achieved. To maintain filter self-regeneration, the exhaust temperature must be maintained at a minimum temperature of approximately 580 F (300 C) for a minimum of the 30% of the duty cycle. As soon as exhaust gas passes through the particulate filter, it begins to capture soot particles. The particles remain trapped on the wall-flow filter’s surfaces until the exhaust temperature reaches the minimum self-regeneration temperature (580 F) when they begin to actively interact with the catalyst oxidizing the trapped particles that consist of hard carbonaceous material, soluble organic fraction (SOF) and other combustion by-products. 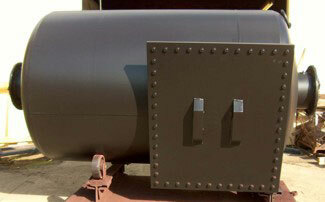 The trapped materials are oxidized and converted to harmless, gaseous carbon dioxide (CO2) and water vapor (H2O). As long as the operating temperature remains above of the minimum regeneration temperature, the trapped soot particles undergo the oxidation process and the filter remains in a regeneration mode. The filter pressure drop will depend upon the amount of trapped particles. The longer the filter remains in the regeneration mode, the lower the unit pressure drop. The preferred diesel fuel grade ultra-low sulfur diesel (ULSD) containing 15 ppm sulfur or less. This grade fuel will allow regeneration to occur at the lowest possible temperature with minimum required duty-cycle period. Should fuel containing higher levels of sulfur be utilized, the required minimum operating temperature will increase and operation at 700 F and above is recommended for the minimum 30% of the duty cycle. Because our washcoat and catalyst formulations are sulfur tolerant, operating at the higher sulfur level will not damage the catalyst coating or the ceramic (cordierite) filter element. California Air Resources Board (CARB) verified with “red dye” #2 fuel containing 500 ppm sulfur.